Drugstore Cowboy | WHAT A FEELING! “It’s hard bein’ a dope fiend,” casually advises Bob Hughes, the protagonist of Drugstore Cowboy, as he begins his narration. That statement, which will be more than justified by the film that follows, perfectly captures the matter-of-factness, the funkiness, and yes, the humor of this superb film. Drugstore Cowboy, which is based on an unpublished novel by a convict named James Fogle (currently serving a 22-year-sentence at Walla Walla), is a movie that looks at the lives of a group of addicts and thieves who rob drugstores in and around Portland, Ore., in 1971. Bob Hughes (Matt Dillon, in an excellent performance) is the leader of a crew that includes his junkie wife Dianne (Kelly Lynch), an easily influenced friend, Rick (James LeGros), and Rick’s hapless teen-age girlfriend Nadine (Heather Graham). This group stages some pathetic drugstore robberies and tries to stay a step ahead of the Portland cop (James Remar) who dogs them. Bob dispenses street smarts as well as drugs, and he also lectures on his superstitions, such as the ill luck that accompanies a hat on the bed or the mention of a dog. In a hilariously serious speech, Bob recalls the dog that inadvertently betrayed him after a stick-up. Drugstore Cowboy was directed and co-written by Gus Van Sant, whose first feature was Mala Noche, an interesting black-and-white film of Portland’s streets. 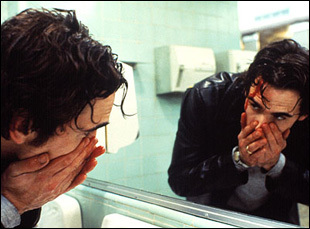 The look of Drugstore Cowboy often seems drug-induced, approximating the artificial highs and lows of chemically altered states. Occasionally a shower of dreamy images will fall across the screen, suggesting Bob’s childlike visions while shooting up. The story sounds unpleasant, and some of it is seamy enough. But the humor is steady and black, including, believe it or not, the smuggling of an overdosed corpse through a parking lot full of police cars. Van Sant does a remarkable balancing act in this movie, and the result is a film in which every moment seems connected to every other moment. Nothing is extraneous or wasted. That includes the appearance, when Bob makes an attempt to go straight, of an old priest—”the most notorious dope fiend on the coast”—who is played by William S. Burroughs, the writer who created a startling vision of drug addiction in Naked Lunch. Drugstore Cowboy belongs in that company. You will not find a “Just Say No” message in Van Sant’s film. Drugstore Cowboy isn’t interested in condemning or punishing its characters; they’re already doing that to themselves. Instead, this movie submerges itself completely in a particular world. It is utterly convincing. October ’89: maybe that’s why Drugstore Cowboy seems like a Nineties movie. In a way, it’s about how addiction and the need to have a belief system are related; I anoint it the best film of 1989 at The Crop Duster, and say a couple more things about it there. The “Just Say No” reference is a reminder of how refreshing this movie’s approach was in the teeth of Nancy Reagan’s campaign, which, to be fair, did successfully end significant drug abuse in this country. A 45 from the soundtrack on YouTube, an indication of the film’s subcurrent of religiosity, here. This entry was posted on Friday, December 31st, 2010 at 4:00 am and is filed under 1989, Actually Good 80s Movies. You can follow any responses to this entry through the RSS 2.0 feed. You can leave a response, or trackback from your own site.